Yesterday early evening, as I was heading to the woodshop, I happened to look up and notice the moon perfectly framed within an opening in the clouds. I tore inside for my camera, but within seconds the clouds had shifted and I had missed my moment... But I took the picture anyways, of the missed moon. Later, while trying to decide what I was going to post for today, I kept coming back to this photo. I thought that it could be a good one to pair with a quote. I liked the Coelho quotation! This evening I lived a "could have" moment. I just was too tired to comply with someone's request. I regretted it a little, but had to listen to my heart - and then I found peace of mind. So I'm in acceptance of the moment as it is, not how it could have been! Love your photo. 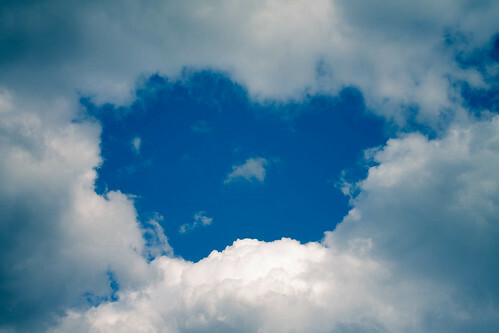 You missed the moon, but the clouds framed the blue sky to give you a heart!